Taylor Kaye has the latest entertainment news making headlines this week. President Obama said he should not have to speak personally with the leaders of Russia and China regarding self-professed NSA leaker Edward Snowden, and said he was “not going to be scrambling jets to get a 29-year-old hacker” during a press conference in Senegal on Thursday. The president was on the first leg of a trip to Africa when he struck the seemingly dismissive tone regarding the former defense contractor who claimed to have leaked details of two top-secret government data-gathering programs before initiating an international manhunt that has grown to involve the governments of China, Ecuador, and Russia. Snowden, 30, is believed to still be hiding at a Moscow airport awaiting a ruling on his request for asylum from the government of Ecuador. Snowden flew to Russia from Hong Kong over the weekend but has not been seen since his arrival. Russian officials told Reuters that he remains in a transit area at Sheremetyevo airport. He was not aboard an Aeroflot flight that departed Moscow to Havana on Thursday, the first stop on an anticipated escape route to the South American country. A man reads a newspaper with the Spanish headline “Snowden stuck at Moscow airport” in Quito, Ecuador, on Wednesday. Snowden’s case resolved “some pretty significant vulnerabilities” at the National Security Agency, Obama said. Snowden worked for defense contractor Booz Allen Hamilton before being fired, and said in an interview with the South China Morning Post that he took the job to gain access to sensitive information. NBC News could not independently verify the report. The U.S. is worried that Snowden might have other documents in his possession that he may “dribble out,” Obama said. Ecuador’s communications minister said on Thursday that his country renounced hundreds of millions of dollars in trade tariff benefits, the Associated Press reported. Communications Minister Fernando Alvarez said the trade benefits being considered for renewal by U.S. lawmakers had become an “instrument of blackmail” as the country considered granting asylum to Snowden. Ecuador “does not accept threats from anybody, and does not trade in principles, or submit to mercantile interests, as important as they may be,” Alvarez said, according to the AP. In Washington, the head of the Senate Foreign Relations Committee has threatened to lead the effort to remove preferential trade treatment for Ecuadorian goods if the country decides to offer asylum to Snowden. Hours later, U.S. Trade Representative Michael Froman told reporters the administration had accepted an industry petition to consider revoking Ecuador’s benefits under the Generalized System of Preferences program. That petition actually pre-dates current tension between the two countries over Snowden. In 2012, Ecuador exported some $5.4 billion worth of oil, $166 million of cut flowers, $122 million of fruits and vegetables and $80 million of tuna to the United States. Menendez said he would lead efforts to stop the renewal of Ecuador’s duty-free access to America markets under the Generalized System of Preferences program, which expires on July 31. He also said he’d try and block renewal of the Andean Trade Promotion and Drug Eradication Act, which also expires at the end of July. The ongoing incident has also heightened tensions with China, as the country’s defense minister said that the U.S. Internet monitoring program revealed in documents leaked by Snowden “has revealed the concerned country’s true face and hypocritical behavior.” Defense ministry spokesman Yang Yujun did not explicitly name the United States in his comments, Reuters reported. NBC News’ Ghazi Balkiz and Reuters contributed to this report. A Maltese dog insured by Pets Best Insurance ate sand at the beach and landed at the Vet. Tango, a German shorthaired pointer…chose to make a beach towel a summertime appetizer. Pets Best Insurance, a leading nationwide pet insurance agency, has released its annual list of the top five bizarre and expensive insurance claims for the summer season. Since opening its doors in 2005, the Boise-based insurance company has experienced a steady stream of unusual summertime claims. Zoie, an energetic Maltese, was living it up during a trip to the beach… until she swallowed some sand. When that followed with loss of appetite and vomiting, she ended up at the vet’s office twice for close monitoring and treatment with intravenous fluids. Her total for both vet bills was $1,991, with Pets Best reimbursing $1,394. For information about pet insurance plans offered by Pets Best Insurance, please visit http://www.petsbest.com. Dr. Jack L. Stephens, president of Pets Best Insurance, founded pet insurance in the U.S. in 1981 with a mission to end euthanasia when pet owners couldn’t afford veterinary treatment. Dr. Stephens went on to present the first U.S. pet insurance policy to famous television dog Lassie. Pets Best Insurance provides coverage for dogs and cats and is the only veterinarian founded and operated pet insurance company in the United States. Dr. Stephens leads the Pets Best Insurance team with his passion for quality pet care and his expert veterinary knowledge. He is always available to answer questions regarding veterinarian medicine, pet health and pet insurance. The Pets Best Insurance team is a group of pet lovers who strive to deliver quality customer service and value. Visit http://www.petsbest.com for more information. Pet insurance plans offered and administered by Pets Best Insurance are underwritten by Independence American Insurance Company, a Delaware Insurance company. Independence American Insurance Company is a member of The IHC Group, an insurance organization composed of Independence Holding Company, a public company traded on the New York Stock Exchange, and its operating subsidiaries. The IHC Group has been providing life, health and stop loss insurance solutions for nearly 30 years. For information on The IHC Group, visit: http://www.ihcgroup.com. In states in which Independence American Insurance Company’s new policy form has not yet received regulatory approval, Aetna Insurance Company of Connecticut will underwrite policies. Each insurer has sole financial responsibility for its own products. To determine the underwriter in your state, please call Pets Best at 1-866-929-3807. Alotto Gelato, 931 N.W. 23rd Ave.
Salt Straw, 838 N.W. 23rd Ave. Cool Moon Ice Cream, 1105 N.W. Johnson St.
Ben Jerry’s, 301 N.W. 10th Ave. and 524 S.W. Yamhill St.
Ruby Jewel Scoops, 428 S.W. 12th Ave. Cool Harry’s Yogurt, 599 S.W. 10th Ave.
Lucky Spoon Frozen Yogurt, 780 S.W. Jefferson St. If you’re the wait-out-the-heat indoors type, check out the air-conditioned Portland Art Museum’s Free Fourth Friday, this evening from 5 to 8 p.m., 1219 S.W. Park Ave. No admission, and in honor of the Cyclepedia exhibit, pedal-powered food carts, including tacos, ice cream and smoothies. On Saturday, the museum, in collaboration with Women on Wheels, Women on Bikes, and CycloFemme, is holding a series of talks and presentations (in the air conditioning) about the past, present and future of women and bicycles. It starts with “Past” at 12:30 p.m., goes to “Present” at 1:30 p.m., and ends with “Future” and 2:45 p.m. If you’re more the type to embrace the heat, tonight’s Colored Pencils Cultural Night at Director Park, downtown at Southwest Park and Taylor, offers an evening of music, dance, food and art from 5:30 to 9 p.m. tonight. The event, co-hosted by the Somali American Council of Oregon, will end with the band “Three for Silver,” which features a Brazilian drummer, Polish violinist, Russian clarinet player and Hungarian guitarist. Music-wise we’re flush this weekend. Wooden Indian Burial Ground — which Portland Monthly calls “officially one of Portland’s best new bands” — will be rocking Star Theater, 13 N.W. Sixth Ave., on Saturday, with AND AND AND, Grandparents, and Summer Cannibals. Admission is $5. And on Portland Monthly’s recommendation: Jimmy Mak’s, 221 N.W. 10th Ave., on Saturday is hosting a tribute to Etta James, the blues star who passed away last year. Some of the top lady singers in the Northwest will sing Etta James’ hits. Admission is $10, with shows at 7:30 and 10 p.m.
Catch some comedy at Portland Center Stage‘s Ellyn Bye Studio, 128 N.W. 11th Ave., with “Lone Wolves,” presented by Slingshot. The Mercury’s recommendation wins me over: “Steven Humphrey is debuting his months-in-the-making statement about Taylor Swift. It involves 40 puppets.” Tickets are $15 in advance or $20 — cash only — at the door. 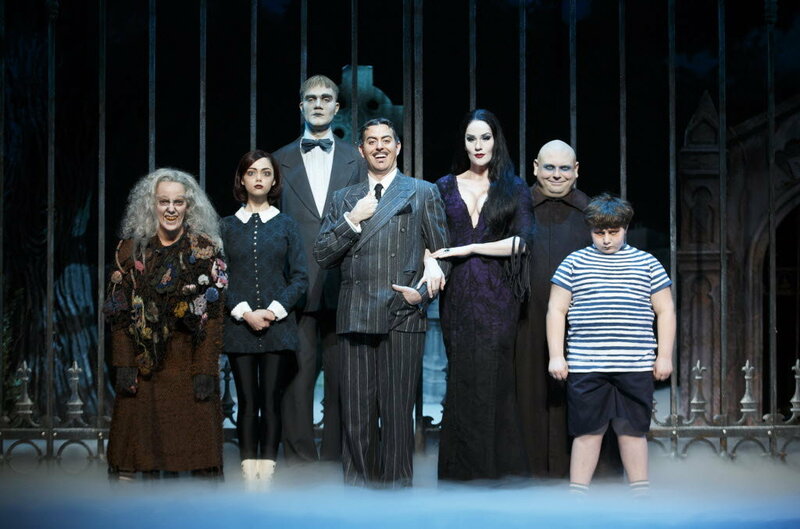 On the theater front, “The Addams Family” musical opened this week at Keller Auditorium, 222 S.W. Clay St. The Oregonian’s review says there’s some repetition in the tunes, but “the show is awash with wry, dark humor, sentimental ballads and cheerful song-and-dance numbers, contrasting with the mock macabre sensibilities the cartoon family is known for.” If anything, casting appears to be hilariously on point. Shows are 7:30 p.m. tonight, 2 and 7:30 p.m. Saturday, and 1 and 6:30 p.m. on Sunday. Tickets are $25 to $75. And this is the last weekend for a few other shows: the lauded “The People’s Republic of Portland” at Portland Center Stage, 128 N.W. 11th Ave.; the emotional “Ithaka” at Artists Repertory Theatre, 1515 S.W. Morrison St.; and the mind warping “Somewhere in Time” at Gerding Theater, 128 N.W. 11th Ave.
New Delhi, June 27 (IANS) A new survey shows that changing lifestyle has exposed women to the risk of cardiovascular diseases, shattering the popular belief that oestrogen hormone protects them from such ailments. The survey, “Visualising the Extent of Heart Disease in Indian Women”, revealed that 65 percent doctors believe that oestrogen’s deficiency due to changing lifestyle and other co-morbid conditions are among the top five reasons responsible for younger women developing cardiovascular diseases. According to the survey, 55 percent of cardiologists observed 16-20 percent growth in cardiovascular diseases among women in the last five years, while 41 percent of the doctors claimed 10-15 percent growth in such diseases among women in the age group of 20-40 years — the category which was earlier considered protected from heart ailments. “Quite contrary to conventional medical ideology that due to oestrogen hormone women, especially menstruating ones, are safe from heart diseases, lately, there has been a significant rise in number of female cardiovascular patients,” said J.P.S. Sawhney, senior cardiologist at the Sir Ganga Ram Hospital here. “The trend may be attributed to changing lifestyle, which is bringing such drastic hormonal changes that the heart protecting effect of oestrogen is getting nullified,” Sawhney added. The survey showed that due to changes in lifestyle, not only have the risk factors for the cardiovascular diseases like stress, smoking and drinking increased considerably, but co-morbid conditions like obesity, hypertension and diabetes have also gone up. But despite the threat, 83 percent of the doctors believed that Indian women are ignorant about heart diseases, while 76 percent observed that women die of heart diseases as they do not seek medical assistance in time for their condition. Sixty-six percent of doctors agreed that cardiovascular disease-related deaths among women are due to late diagnosis. “Women often overlook symptoms and discomfort pertaining to heart diseases, and rarely consult an expert. Even if they opt for consultation, more often than not, they discontinue the treatment as soon as they get symptomatic relief. The compliance rate is comparatively poor among women,” Sawhney said. “Considering the fact that working women juggle home and work responsibilities, they are more likely to get exposed to stress and unhealthy lifestyle and, therefore, may be more prone to cardiovascular diseases as compared to non-working women,” said Chandrakant S. Pandav, head of the department, Centre for Community Medicine, All India Institute of Medical Sciences (AIIMS). “Nevertheless, due to huge burden of household responsibilities and lack of self-care, non-working women cannot be considered to be at lesser risk,” he added. The survey covered about 600 cardiologists and general practitioners from both metro and non-metro cities and was based on subjective and objective questions. “In India more than 400 million people have stress, which is one of the major reasons of all health problems, and change in lifestyles is a major reason causing cardio-vascular diseases, Pandav said. “Cardio-vascular diseases in women in India, where a large percentage of the population is diabetic, are likely to increase by 17 percent in the coming 10 years, Kapil Yadav of the Centre for Community Medicine, AIIMS said. OAKVILLE, ONTARIO–(Marketwired – Jun 25, 2013) – Pethealth Inc. (PTZ.TO) (“Pethealth” or “the Company”), North America’s leading provider of animal management software, microchip identification for companion animals, and pet health insurance, is pleased to announce that the total animals in the inventory of animal welfare organizations (“AWOs”) utilizing the company’s PetPoint data management system passed the 400,000 threshold on June 19, 2013. As a hosted application, the Company aggregates more data on both the animals in the care of AWOs as well as animals adopted to the public than any other company. In surpassing the 400,000 plateau, the Company reported that it had 212,271 cats, 175,482 dogs and 12,257 other animals, including birds, rabbits, reptiles and other exotic animals in inventory. In 2012, total animals in inventory peaked at 373,012 on October 12, 2012. Animals in inventory of shelters generally peak in late 3rd quarter or early 4th quarter each year. The Company’s ability to aggregate data, including products purchased and used by AWOs in their day-to-day operations has allowed the Company to become a leading distributor for companion animal product manufacturers including Allflex USA Inc., Velcera, Inc. (now owned by Perrigo Company) and Mars Symbioscience. The Company’s position as the largest aggregator of shelter data has also made it the most trusted source within the Wall Street community for shelter data. On the third Monday of each month, the Company publishes its PetPoint Report which tracks all the significant trends in animal welfare. Reports can be viewed by visiting www.petpoint.com. Increasingly banking analysts are focusing on trends in the animal welfare industry, including pet adoption, to better determine the valuations of those publicly traded companies they follow whose operations in whole or in part are focused on the companion animal marketplace. Bank of America Merrill Lynch, CL King Associates, Robert W. Baird Co., Nomura Equity Research, UBS Investment Research and Cleveland Research Company represent the growing number of financial institutions that now rely on the Company’s monthly PetPoint Reports. It is estimated that 30% of new pet acquisitions are now completed via animal welfare organizations. PetPoint also powers the Company’s industry leading Petango.com network, including the only adoptable search website with live feeds of all animals posted as available for adoption. Updates to available animals and their profiles on Petango.com occur on average within 5 seconds of the change being effected in PetPoint. As a result of this unique capability the network has received an average of over 900,000 unique visitors per month in 2013, an increase of over 7% YoY. Petango.com was the second largest adoptable pet site in the world in terms of unique visitors in May 2013 according to comScore. As the most accurate database of adoptable pets available, the site is trusted by many of North America’s largest AWOs to power adoptable search on their own websites, including the Atlanta Humane Society, Kentucky Humane Society, the Washington Animal Rescue League, Sacramento SPCA and SPCA Serving Erie County, as well as over 900 other AWOs licensing the Company’s PetPoint software. Licensed shelters therefore have the same live content on their own websites as found on Petango.com, thus making the search online for an adoptable dog or cat more robust and satisfying for visitors. No other adoptable search site provides the same degree of live content. Web traffic data compiled and transferred to PetPoint daily from these AWOs, for the period January 2013 to May 2013, totaled nearly 71M pages viewed, an increase of 52% YoY. PetPoint was first introduced in March 2005. As a cloud based application, PetPoint not only helps shelters to better organize and manage their daily operations, but also to reduce, if not eliminate, IT-related infrastructure costs. Equally important, the application enhances operational reporting, allowing AWOs to better understand and use their data to reduce euthanizations and increase adoptions in the communities they serve. The Company previously reported that it had surpassed the 2,000th licensed AWO. As of today’s date, 2,004 AWOs had licensed its application. The success of PetPoint has made Pethealth the largest aggregator of data on animals entering AWOs. In 2012, over 2.3-million intakes were recorded through the software and over 980,000 adoptions. As of today’s date, over 12.2-million animal intakes and over 4.7-million adoptions have been completed via the application since the product was first launched in 2005. PetPoint, first introduced in 2005, is now licensed by over 2,000 animal welfare organizations in North America and has facilitated the adoption of over 4.7-million pets. As a cloud based application, animal welfare organizations can not only better organize and care for their homeless and abandoned animals, but can also reduce significantly, if not eliminate, their IT-related infrastructure costs. PetPoint is provided free to animal welfare organizations on the basis that these same organizations use the Company’s 24PetWatch microchip and gift of insurance programs for all companion animals adopted, adoptable animals are then published on the Petango adoptable search platform. The 24PetWatch microchip program is the most widely used microchip and lost pet recovery service operating in both Canada and the United States. Pethealth is North America’s second largest provider of medical insurance for dogs and cats to pet owners, operating in the United States, Canada and the United Kingdom. In addition, the Company is the leading provider of management software to North American animal welfare organizations through its SaaS-based application and is the leading provider of pet related database management services to the North American companion animal industry. Pethealth offers a unique range of products and services for veterinarians, shelters and pet owners through a number of wholly owned subsidiaries using a range of brand names including PetCare, 24PetWatch, Pet Protect, Petpals Direct, PetPoint, Petango.com and ThePetangoStore.com. last week while vacationing in Rome. the sequel, according to director Roland Emmerich. LOS ANGELES, June 24, 2013 /PRNewswire/ — HitFix (www.hitfix.com), the fastest growing provider of authentic entertainment news, today announced the launch of HeroFix, a new channel dedicated to sharing the latest and greatest from the superhero universe. A joint partnership with top comic site Comic Book Resources (CBR), HeroFix coverage will include comic book news and previews as well as general pop culture – film, TV and more – as it increasingly crosses into the world of superheroes. This strategic partnership goes beyond editorial to also see HitFix representing CBR in the advertising arena, creating a first to market opportunity for clients. HeroFix is now available at www.hitfix.com/HeroFix. CHICAGO, IL–(Marketwired – Jun 24, 2013) – For obese people with type 2 diabetes, a long-term intensive lifestyle intervention program, focused on weight loss, can improve physical quality of life, reduce microvascular complications, lower the risk of depression and lower medical costs by reducing the need for hospitalizations, outpatient care and medications, according to research presented today at the American Diabetes Association’s 73rd Scientific Sessions®. However, the intensive lifestyle intervention did not reduce the risk for heart attacks or strokes more than a comparison group given diabetes support and education, results from the Look AHEAD (Action for Health in Diabetes) clinical trial revealed. Look AHEAD is a two-armed randomized trial conducted in 16 centers across the United States with more than 5,000 overweight or obese adults aged 45-76 years diagnosed with type 2 diabetes. Funded by the National Institutes of Health National Institute of Diabetes and Digestive Kidney Diseases (NIDDK), the study assigned participants to one of two interventions: lifestyle (involving physical activity and weight loss), or diabetes support and education (involving three counseling sessions per year on nutrition, physical activity and social support). “Participants were followed for up to 11.5 years, with a median follow-up of 9.6 years at the time the intervention ended. The primary goal was to determine whether the intensive intervention would reduce the risk of cardiovascular mortality and morbidity,” said Rena Wing, PhD, chair of the Look AHEAD trial and professor of Psychiatry and Human Behavior at Alpert Medical School of Brown University in Providence, R.I. Though participants in the intensive lifestyle intervention group initially lost 8.6 percent of body weight and maintained a loss of 6 percent of body weight at the end of intervention, which was better than researchers expected, the intensive lifestyle group did not reduce their risk of cardiovascular morbidity or mortality, or the level of LDL-cholesterol (the so-called “bad” cholesterol) compared to the group that received diabetes support and education. The support and education group lost 0.7 percent initially and 3.5 percent at the end of intervention. Wing said there were numerous possible explanations for the unexpected results, including the greater use of medications to lower LDL cholesterol in the comparison condition, which may have minimized any difference between the groups. The study cannot rule out the possibility that greater weight losses might impact cardiovascular risk. However, the intensive lifestyle intervention group did experience other benefits when compared to those in the comparison group, including reducing the risk of kidney disease, self-reported retinopathy and depressive symptoms. Other benefits included an improved physical quality of life, and reduced annual hospital rates and costs. Lifestyle intervention also produced greater reductions in A1C, and greater initial improvements in fitness and all CVD risk factors except LDL cholesterol.